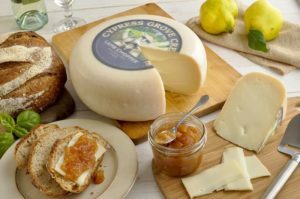 Cypress Grove’s famous goat cheeses are made with vegetable-based rennet. I’ve been a vegetarian since the mid-1980s. For me, that means I don’t eat meat, fish, fowl, or any product made from them, with one exception: I do love to eat great caviar (fish eggs). We all have friends who are vegetarian to varying degrees and define their eating habits with unique parameters. What you may not know is that cheese can be a sticking point for many of them due to the nature of rennet, the agent used to separate curds from whey. There are three categories of rennet that a dairy can choose from. The first is microbial, which is derived from enzymes produced by certain molds and synthesized in laboratories; this rennet is suitable for every type of vegetarian. The second is vegetable rennet. As one would expect, it’s made from plants; the most frequently used plant is the stamen from thistle flowers. Thistle rennet is widely used in Mediterranean sheep’s milk cheeses, among others. The third, most traditional type is animal rennet, which was originally derived from the fourth stomach of young cows. Animal rennet is no longer harvested from calves: it’s now a laboratory product made by isolating rennet genes (from animals) and introducing them to fungi. I eat cheeses made from animal rennet because I know it comes from a lab, plus so very little is used in the cheesemaking process – 1 kg of cheese contains about 0.0003 grams of rennet enzymes – but of course I support the decision of any vegetarian who decides against eating it. If you’re a strict vegetarian, there’s still a very large selection of vegetarian-friendly cheeses of many varieties and price points. For example, the artisan cheesemakers at Cypress Grove make beautiful goat’s milk cheeses using exclusively vegetable rennet. The same goes for Vermont Creamery, another producer of fine goat’s milk cheeses. The incredible Serra da Estrela, known as “the king of Portuguese cheese,” is a perfect example of a lush, creamy cheese that uses thistle rennet. Rest assured there are many supermarket cheeses that use vegetarian rennet as well: Galbani, producer of widely distributed mozzarella; Kerrygold, makers of very good Irish cheeses; and Tillamook, the popular cheddar purveyor all make cheeses using vegetarian rennet. Even Laughing Cow, the makers of the small-portioned snack cheeses, and most of Costco’s Kirkland Signature brand cheeses are all made using non-animal rennet. Point being: there are many options for whichever type of vegetarian cheese you’re planning to enjoy. If you’re looking for a great cheese-list resource for vegetarians, you can find it here. Read the full story on The Daily Meal.